OK, I'm back, after several months of work and travel, which included losing the top of the Eiffel Tower, and finding it again, avoiding an Ebola E-coli outbreak in Hamburg, and retracing the route of The Italian Job in Torino, it's about time I got back to some real work and started posting on the blog again! 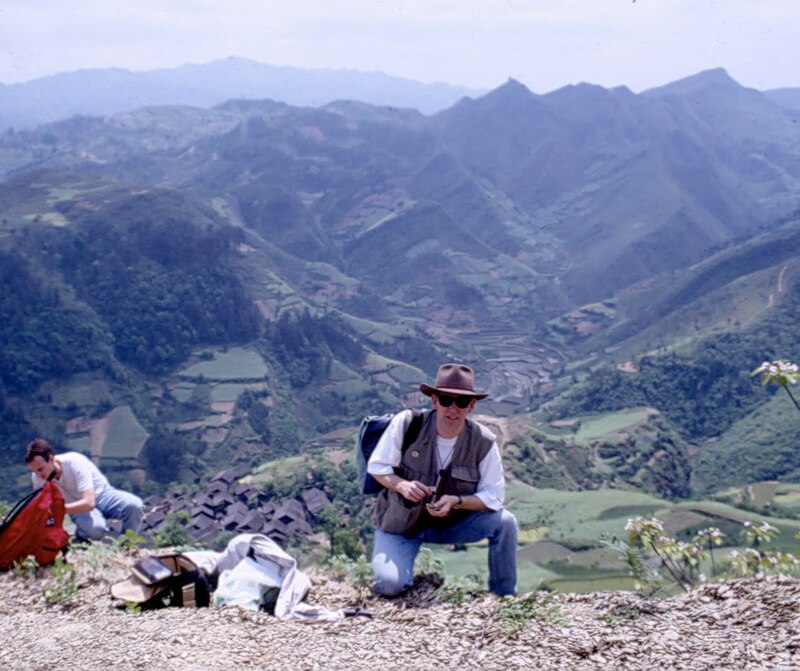 Continuing the tradition of famous fossil sites wot I have visited, the photo above (taken a few years ago now) is of me doing my Indiana Jones impression on a hilltop at the site of the Kaili Formation in Guizhou province, southwest China, some 550 kilometres ENE of Kunming and the Changjiang fauna. 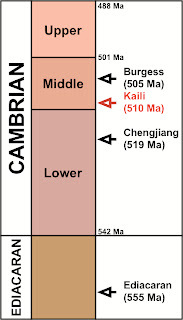 The Kaili formation is basal Middle Cambrian in age (see figure at right) and contains the Kaili Biota, a Changjiang/Burgess Shale type lagerstätte. Given it's age, the biota sits midway in age between the Lower Cambrian Changjiang fauna and the Middle Cambrian Burgess Shale fauna. 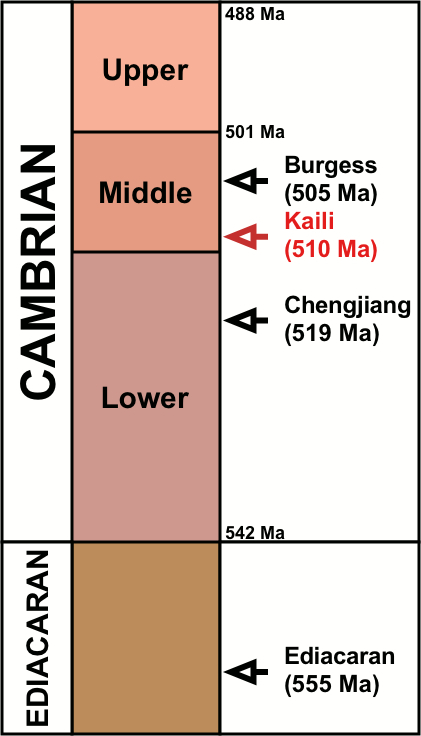 As would be expected, the Kaili biota shows significant overlap with both the Chengjiang and Burgess faunas in terms on genera in common. 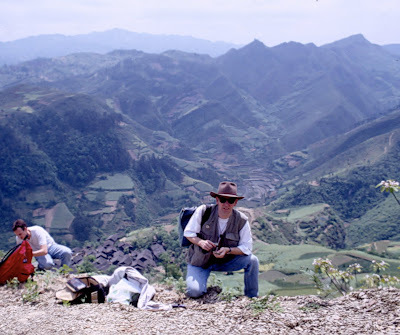 Wikipedia, suggests that of the (quite diverse) 110 genera occurring in the Kaili biota, 30 are shared with the Chengjiang fauna, and 40 are shared with the Burgess fauna. 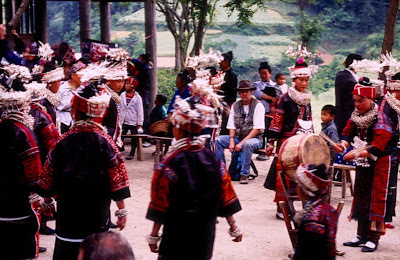 We had entered a village of the Mountain Miao Minority Peoples of Guizhou, and they laid on a traditional welcome ceremony for us. 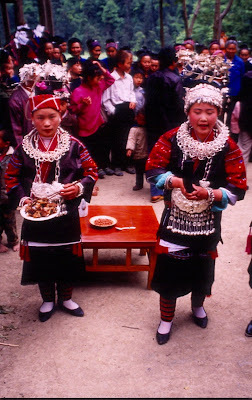 This started with two local girls in full traditional costume offering food and drink to each person as they entered. The traditional dress included amazing jewelry in solid silver! 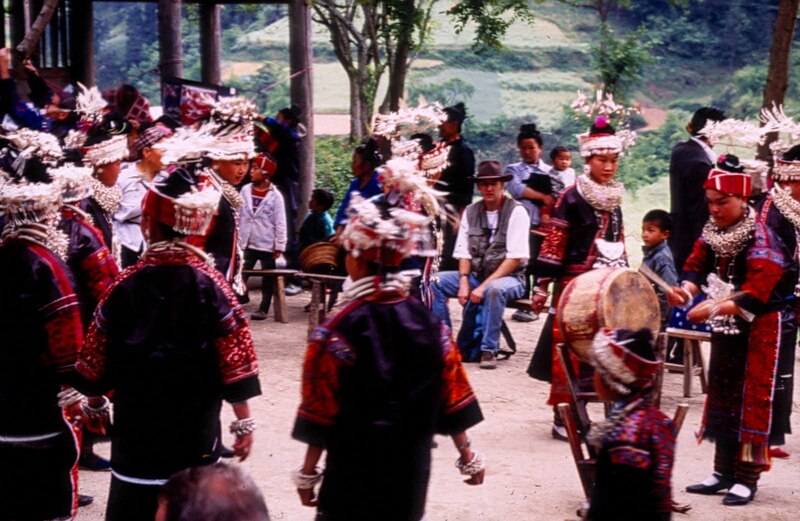 On this occasion we were offered fish and some lethal alcoholic local brew from a ceremonial horn. Once inside we were treated to a series of traditional dances, again performed by the girls of the village complete with elaborate gorgeous silver jewelry. We were not informed that this was going to happen so it was a complete surprise. It was an amazing experience, and was the perfect end to the day. That must have been a wonderful experience. I would like to know more about any fossils you found there, though. I missed you and your blog. Welcome back! I missed you and your blog. Glad you're posting again. Keep the field stories coming! Ignore useless comment #1. You're about the only person I've found who blogs about the Ediacaran, so your presence is most welcome. You were most definitely missed and I'm very glad you're back. Agree with PS, you are one of the few who cover late Proterozoic and very early Paleozoic life where "everything changes". I missed you, but I got out of the habit of checking daily if you were back, so I just noticed today!